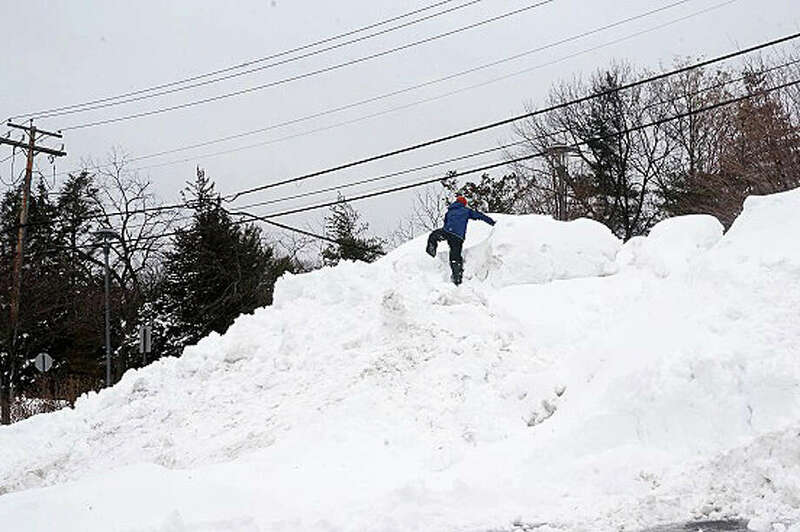 One kid scaled "Mount Fairfield" on Thursday afternoon -- otherwise known as the snow pile amassed by plows clearing the parking lot at Roger Ludlowe Middle School. After the snow stopped falling yesterday, and the bone-chilling "wintry mix" eased, Fairfielders hit the slopes. Slopes of snow, some several feet deep, piled up at the end of the driveways and the perimeters of parking lots. Shovels. Sleds. Skis. Snowballs. All played roles in the fallout from the latest snowfall. After a smattering of light snow early today, the cleanup -- and play time -- continues as the clouds clear and the temperature rises to a high in the upper-30s, according to the National Weather Service. Tonight, however, clouds return as the temperature drops to a low in the mid-20s. Tomorrow, snow is likely to fall once again, the NWS says, sometime after 9 a.m. The daytime high temperature will be about 33 degrees, with the predicted snowfall accumulation of 1 to 3 inches possible. After the storm clears out, very cold weather grips the region again, with a nighttime low in the low-teens -- and wind-chill values as low as zero. Sunday is expected to be mostly sunny, with a daytime high temperature in the upper-20s. But by Monday evening, more snow is in the forecast.